To ensure the chicken remains succulent, defrost slowly in the fridge and reheat gently. Add a handful of chopped parsley before serving and accompany with mashed potato and a green vegetable, such as peas. Preheat the oven to 140°C/gas 1. Wash the chicken and pat dry. Cut into eight pieces, two from each breast and two from each leg. Put a heavy-bottomed ovenproof casserole dish over a medium heat with 2 tbsp oil. Once hot, add the chicken, a few pieces at a time, and fry on all sides until golden brown. Remove and set aside in a large dish. Add the shallots to the pan and sauté for 10-15 minutes until golden and beginning to soften. Add to the chicken. Add the diced bacon to the pan and fry until it begins to colour. Add the carrots and continue cooking until they begin to soften. Mix in the mushrooms and cook until lightly coloured. Add all the contents of the pan to the chicken, leaving any juices in the pan. Reduce the temperature to low, pour another 1-2 tbsp oil into the pan, add the flour and stir into the pan juices. Cook for a couple of minutes or until it starts to look cooked and lightly coloured. Immediately, stir in the garlic and the wine, followed by the stock. Return to the boil, and cook briskly until it has thickened slightly. Meanwhile, pour the brandy over the chicken mixture. Set alight and once the flames have gone out, tip the mixture, juices and all, into the simmering sauce. Add the herbs and lemon zest, and season to taste (remembering that freezing can intensify the saltiness of a dish). 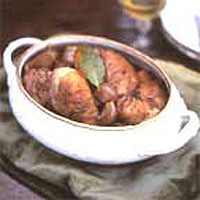 Once the casserole returns to the boil, cover and place in the oven for 45 minutes, or until the chicken is tender and cooked through. It is then ready to serve, or to cool and freeze.